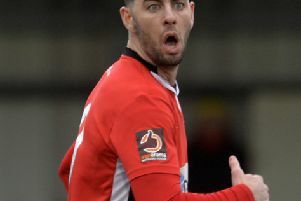 Eastbourne Borough produced a woeful display as relegation candidates East Thurrock won their first away match of the season at Priory Lane on Saturday. Nobody could deny the Rocks the points. Right from the kick-off they swarmed all over the Sports, quicker to virtually every ball and more accurate in their distribution. It all added up to another frustrating 90 minutes for the long-suffering home fans and there were furious shouts of ‘rubbish’ as their team walked off at the final whistle. Borough were on the back foot from the start with keeper Sam Howes twice in action inside the first five minutes. But the hosts were desperately unlucky to concede a penalty in the sixth minute. Tom Gardiner was harshly judged to have handled in the area and Sam Higgins fired the spot-kick low into the corner of the net. Higgins should have doubled the advantage within minutes but was far too high with his finish. Football is a game of fine margins as Jamie Howell’s men learned to their cost in the 19th minute. First Gardiner’s header crashed against the bar following a corner. 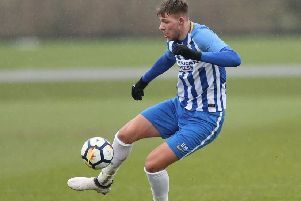 The ball was cleared downfield leaving the isolated Howes, well out of his goal with the seemingly simple task of playing it back into the home area. But his clearance thundered off Rocks striker Sam Ashford who managed to run on and turn the ball into the empty net from the acutest of angles. Borough attempted to hit back and loanee Reece Myles-Meekums had a great chance to score on his debut but was blocked by the keeper as he moved in from the right. The home players looked to have benefited from Boss Howell’s half-time words. as they made the early second half running, Joe Quigley, in what was thought to be his final game for Borough, fired against the woodwork, Charlie Walker’s header rebounded off the post and Ryan Hall’s searing drive fizzed inches wide. The fierce wind and a packed Thurrock defence were hardly conducive to Borough’s cause. Far too often the ball was in the air with distribution lacking quality. Lloyd Dawes came on to add more life to the proceedings and a roar went up when his header found the back of the net with three minutes of normal time remaining. But the offside flag was up and we were denied a grandstand finish. Borough have now won as many matches away as they have at home and successive home matches against two teams in the drop zone have yielded just a solitary point. The Priory Lane faithful deserve better. Eastbourne: Howes, Adebayo-Rowling, Rents, Wills, Ransom, Gardiner, Cox, Walker (Briggs 68), Quigley, Hall, Myles-Meekums (Dawes 57),. Unused subs: Blackmore, West, Hamilton. Referee: Robert Whitton. Att: 459. MoM: Kane Wills: kept driving his team on, but with little success.